You can live one in this or one of the neighboring towns near the ocean or inland along the river that has ample bays as it nears the ocean. Nearby Shallotte (inland) is a more cost effective solution. There are active adult communities in the area (see link at right). Zillow reports the median home value was $437,200 in late 2018, with a steady rise in prices since mid-2013. Being on the ocean in a quiet and unspoiled part of the state is a unique strength. These towns are so small that you will have to drive for just about anything. Holden Beach has an average January temperature of 45 degrees and an average July temperature of about 80 degrees. There are two restaurants on Holden Beach which provide music and entertainment - Castaways Raw Bar and Grill and Paradise Cafe. 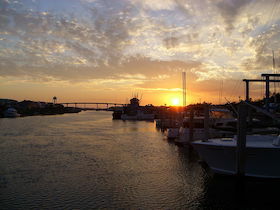 The community also hosts two festivals: Days at the Docks and Fesival by the Sea. The crime rate in this tiny town does not seem to be accurate. It is reported to be very high in recent years because of an astonishing rise in burglaries, but the fluctuation seems hard to believe. J. Arther Dosher Memorial Hospital is 5 miles away in Southport. The closest large airports are in Wilmington, North Carolina- 43 miles away, or Myrtle Beach, South Carolina, 56 miles away.